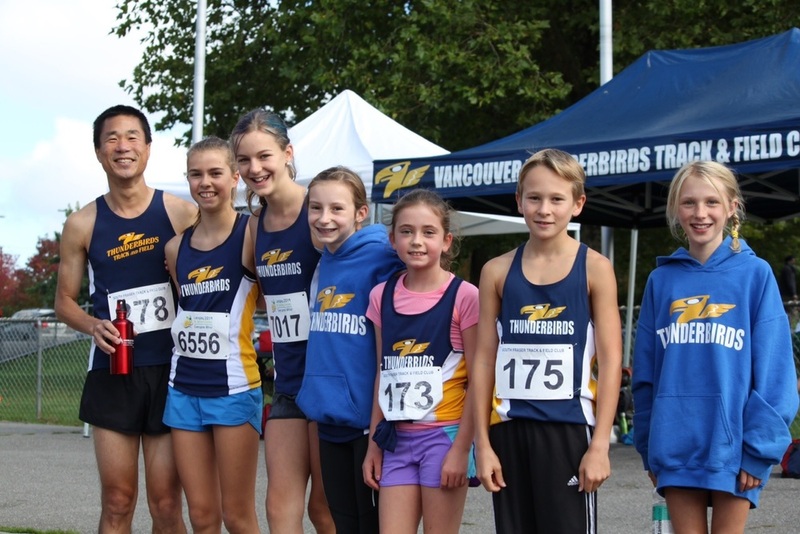 TBird athletes performed impressively at the second meet of the season; the South Fraser Cross Country Meet at Bear Creek park, this past-weekend. Stan Jang finished second overall and won the 45 to 50 age group event. Not to be outdone, Maya Baechler notched up her second win of the season in the 9 year old girls' event, winning by 8 seconds in 5:34. In the girls 10 year old race, a mix up by the rabbit led to a shuffling of the finishing positions with Sophie Forsyth finishing a close 2nd, Finley Butler 4th, Delia Warrington 9th, followed by Sophie Kazirmirski in 10th. Chloe Cady had a really strong race to win the girls' 11 year old race, with Veronica Bumbulovic showing improved fitness in 9th place. In the 12 year old race, Freya Savage battled tough to finish 2nd followed by an improving Paige Ingram in 6th and, in her first run of the season, Sophie Bury (24th). Dylan Ulrich finished a close second in the boys' event followed by team-mates Cole Gladders (7th) and, an improving, Noah Skarsgard in 16th. Maya Baechler and Sophie Forsyth competed the next day in Whistler; finishing 6th and 7th respectively in the 12 and under race. Theo Bentley also finished 6th in the boys`race.